See also a March 2017 posting on poem "The Old Marlborough Road." "If you are ready to leave father and mother, and brother and sister, and wife and child and friends, and never see them again; if you have paid your debts, and made your will, and settled all your affairs, and are a free man; then you are ready for a walk." the bicentennial of the birth of Henry David Thoreau. 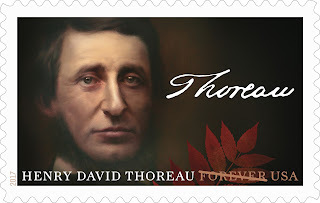 July 12th was the 200th anniversary of the birth of Henry David Thoreau. [Actually, birth-named David Henry Thoreau after his deceased uncle, David Thoreau. Thoreau reversed the order of his names shortly after he graduated Harvard College, in 1837. Apparently, growing up, his family had called him Henry rather than David.] The Thoreau Society recently held its annual gathering of Thoreauvians, to discuss all things Thoreau, and to celebrate the bicentennial of his birth. Many newly published books, and the U.S. Post Office issued a stamp. “The West of which I speak is but another name for the Wild; and what I have been preparing to say is, that in Wildness is the preservation of the world.” Thoreau felt that it was necessary for one’s soul to be able to walk in wildness every day. He was aware, however, that his Massachusetts terrain was not true wildness, but rather a post-colonial return of once-farmed land to wild meadow and forest. Thoreau's three excursions to Maine had brought him into true wildness ("grim"), so he knew the difference. 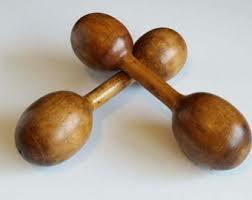 exercise equipment in the 1800s. A human trial conducted at Stanford University (Bateman 2015) concluded that walking surrounded by nature reduced risk of depression more than walking an equal amount of time in an urban setting. The Boston Post was a popular and influential newspaper some 100+ years ago. In 1909, Edwin Grozier, the publisher, decided to promote the newspaper by donating ebony shaft, gold-capped canes to the Boards of Selectmen of 700 towns in Massachusetts, Maine, New Hampshire and Rhode Island. Engraved on the top of the gold head of each cane were the words "Presented by The Boston Post to the OLDEST CITIZEN of __________ [name of town and state] (To be transmitted)." The idea was that the towns would award these BOSTON POST CANES to the oldest male citizen for the remainder of his life, to be returned to the town upon his death, to be awarded to the next oldest, and so on. in 1981. Honoring the oldest resident (male or female) started again in 1999. The canes were made by J.F. Fradley and Co., a New York City silversmith and cane maker. Joseph F. Fradley (1843-1914) began a silversmith business in 1866. His business had an excellent reputation. J.F. Fradley items appear for sale in fine arts and crafts auctions. The business was managed by his son, George F. Fradley, at the time the canes were made. 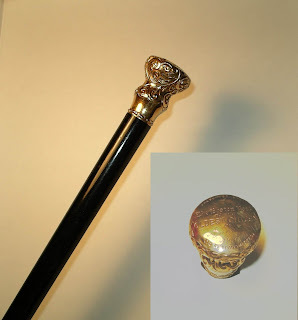 Although many of the newspaper articles about recipients of Boston Post Canes describe the cane heads as 14 karat gold, some of the internet photos show wear to reveal non-gold metal underneath, confirming that the cane heads were gold-plated rather than all gold. This makes sense. Gold, rather than gold plated, would have made the canes prohibitively expensive, even back in 1909. Women achieved the right to vote in 1920, but it took ten more years before The Boston Post approved a changing of the rules to allow women to be awardees. 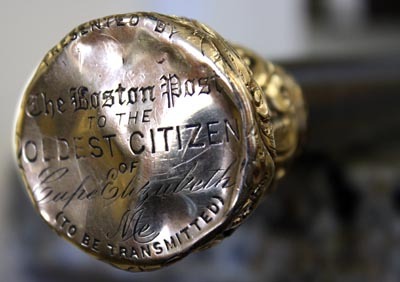 The Boston Post went out of business in 1956, but the Boston Post Cane tradition continues in many towns. As years went by some of the canes were misplaced, stolen, sold, lost or destroyed. Some went missing for years, decades even, only to surface again. In time, most towns decided to keep the original cane in a town office or at the local historical society, and either discontinue the practice entirely or else award a plaque to the oldest resident in lieu of the cane. The Boston Post Cane Information Center [http://web.maynard.ma.us/bostonpostcane/], maintained by the Maynard Historical Society has become a clearinghouse for all things BPC. The starting point was a 1985 article written by Maynard historian Ralph Sheridan. After his death in 1996, David Griffin took up the traces, and still gathers news of canes lost, found and awarded. Side view, showing ebony shaft of the cane. "Ebony"
black keys of pianos, and parts of stringed instruments. A few facts plucked from the BPC website: As of last count, 517 towns continue or have resumed honoring their oldest citizens. Most have the original canes gifted them in 1909, but some are using brass-capped mahogany replicas purchased from the Town of Peterborough, NH. Some towns stipulate that to qualify, a person must be a current resident and living in the town the past 10 or 15 years. Watertown's cane went missing in 1910, and did not return until 99 years later. At the time Mary Josephine Ray of Westmorland, NH, passed away, age 114.8, she was not only the oldest ever holder of a Boston Post Cane, but also the oldest person in the United States. Stow's Boston Post Cane is kept in the Town Vault in the Town Hall building, along with other historically important artifacts. Recipients are presented with a Boston Post Cane lapel pin. The cane had gone missing 1951 to 1971. Actually, it was in the Vault all the time, but misplaced. Since 1971 there have been 12 recipients. The most recent was Dr. Donald Freeman Brown - awarded the cane when he reached 99 years. He passed away in 2014, age 105. The honor and lapel pin have not yet been awarded to a new oldest resident. silver and gold, to prevent tarnish bleeding through the gold. 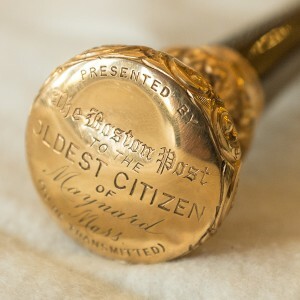 Maynard's Boston Post Cane is on permanent display at the town building. It had gone missing around 1928, not recovered until 1981. In 1999 the Maynard Historical Society decided to revive the tradition of honoring Maynard’s oldest citizen by presenting him or her with a plaque from the Maynard Board of Selectmen. The most recent five: Elizabeth Dodd, Dorothy Barlow, Arlene Cook, Mildred F. Duggan, and currently Ben Sofka. Ben, a life-long Maynard resident, received his plaque in February 2017, and is at present 101 years old. Stow's and Maynard's neighbors do and do not continue the Boston Post Cane tradition. Hudson, Harvard and Sudbury awards plaques to their most senior citizens. Acton is considering restarting the same practice. Bolton and Boxborough apparently do not participate, either because these towns had too small a population to get a cane back in 1909, or because the original canes went astray. Starting in 1962, Concord decided to change to an annual Honored Citizen Celebration. The awardee is steward of the Boston Post Cane for a year and leads the Patriots' Day Parade. From left to right: larvae, nymph, adult male, adult female. Nymphs and adult females are the vectors for human infection. and how to wash and dry clothes to kill ticks. June and July are the prime months for contracting a tick-borne disease. During these months the vector is the nymph stage, which is about the size of a poppy seed. There is a lessening incidence in August, September and further into fall and winter, as the vector becomes the more easily seen adult female tick (the size of a small apple seed), and also because people spend less time outdoors with the onset of colder weather. An observation here: the term 'bite' is not descriptive. If not detected, a nymph will latch on for 3-4 days for a blood meal before dropping off; adult females stay attached for 7-10 days. Adult males are not on you for a meal. Rather, they are wandering around looking to find and fertilize a female. This meet-and-mate part of the tick's life cycle is the reason that deer are integral to a region harboring a serious tick disease problem. Small mammals (mice, chipmunks, etc.) are vectors for the larval and nymph stages to become infected, but a large mammal species such as deer is essential for the mating and final blood meal that allows the fertilized adult female tick to lay up to 3,000 eggs. Lyme, Anaplasmosis and Babesiosis are the big three for New England, but the full count for tick-borne diseases now overtops a dozen. 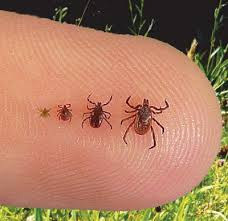 More information on tick-vector diseases can be seen as the Centers for Disease Control website: http://www.cdc.gov/ticks/. The CDC has great information on the tick diseases, and also on practical matters such as how to avoid getting bitten by a tick, and what to do once you have been bitten. Lyme starts subtle. If the stricken person missed the actual bite, then the first sign is often but not always the signature "bull's eye" rash. Moderate fever, chills, fatigue, muscle ache and a headache may accompany the rash. Only months after the rash and the initial set of symptoms are gone is there a possibility that really bad consequences set in: arthritis, partial facial paralysis, meningitis, limb weakness, and so forth. Anaplasmosis is not subtle. The symptoms are more akin to being run over by a car, having it circle around to hit you again, and then one more time to park on your head. Some 7 to 10 days after the bite the symptoms arrive all at once: extreme fatigue, high fever, uncontrollable shivering alternating with profuse sweating, night sweats, headache, nausea, abdominal pain, loss of appetite, weight loss, muscle pain, cough, mental confusion, and extreme fatigue. Really extreme. Babesiosis is not subtle. Symptoms, arriving 10-30 days after being host to a tick, are akin to those of Anaplasmosis, plus it destroys red blood cells and platelets. From the latest data published by the CDC, Massachusetts has more cases of Babesiosis than any other state. The CDC uses the term "malaise," but this does not convey the soul-crushing lethargy of either of these full-speed infections. Not everyone exhibits all the symptoms, and many of these symptoms overlap with what people expect if they have the flu, causing many people to delay seeking a medical evaluation, or doing so, getting a misdiagnosis. Actually, these days, diagnosis and treatment are straightforward. Do you have some or all of that litany of symptoms, especially fever and fatigue? Were you in any place a week or four ago where there might have been ticks? That's it. A blood sample will be taken, but especially early in the course of the infection the test results can be false negative (says you don't, but you do). Standard medical practice is to start antibiotic treatment immediately. Treatment should never be delayed until the lab results are back. These days, there is an assumption that more than one disease is transmitted from the same tick, so for Babesiosis, doctors may prescribe multiple antibiotics. Neither casual contact nor intimate sexual contact will pass on any of these diseases, but receiving a blood transfusion has been a confirmed vector. There are no laboratory screening tests to verify that donated blood is not infected. Not treating infections in a timely fashion can have very serious consequences. Delayed treatment may require hospitalization and intravenous antibiotics. Especially in older or immuno-compromised people there are risks of compromised breathing, kidney failure, nerve damage and death. A practical point - your guests can contact a tick disease here, then travel to regions where doctors may not have tick disease awareness. Your parting words might include "Safe travels, and if you develop a rash or become ill, tell your doctor you were in tick territory."